I was/am primarily a landscape photographer although I’m branching out. I would also claim that I am an historian, but in that endeavor I am out-shined by so many others. Let’s just say I love history and research. I taught college for about ten years, high school for five, and adults for twenty. I’m retired now. I have a Masters of Fine Arts from Claremont Graduate University. I also have a very understanding wife and two grown girls, each with their own offspring. Good article in Nevada Magazine. My hobby is exploring the old roads like the Overland, Pony and the California trail in Nevada. I use a modern car though, a 1930 Model A Ford Tudor. My next project is going to be Fords defeat to Cape Horn. Have you made the trip in your T yet? I don’t see a problem since the Hussy appears late enough to have a water pump, not just thermo siphon plus the modern oils are so much high quality you shouldn’t have a band problem. Not to sure about wood spoke wheels though. The hot dry Nevada Desert takes a toll on them. You may wish to consider a set of 1927 wire spokes. Doesn’t look steep enough to worry about the gravity flow fuel pump failing. 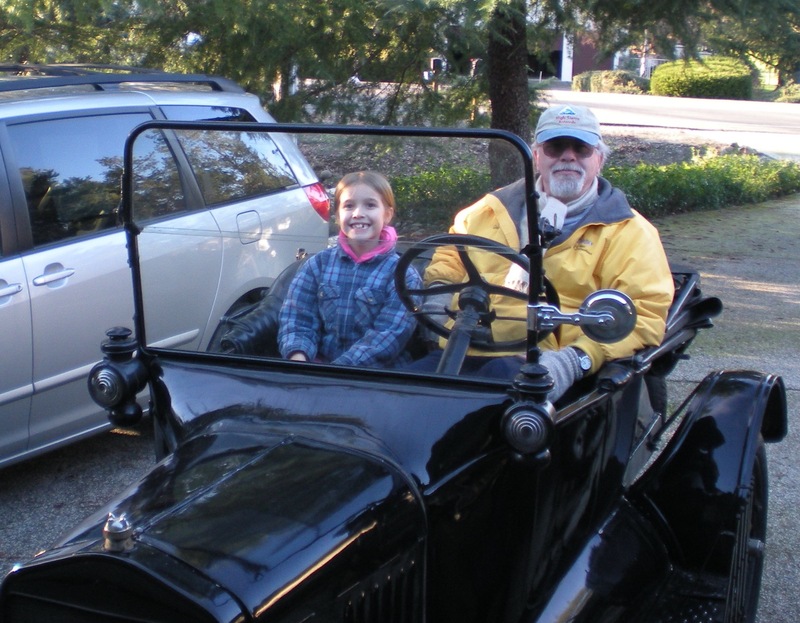 If you haven’t seen them yet, Kathy Franzwa has posted some of Henry Joy’s 1915 photos of Fords Defeat in the Winter issue of The Lincoln Highway Forum. I’m going to do several of the original passes later this year if I can find someone to accompany me. I’m thinking of setting up a “Defeating Ford’s Defeat” tour for Model T Fords if I can drum up enough interest, also for a magazine article. Hamilton to Fourteen Mile House would be another trip. Regarding water pumps, wooden spokes, et al., my car is original and I don’t intend to modify it. It should do ok. I just respoked the wheels and everything is tight. Water pumps are popular but I know many T owners who have removed them. If I’m going to be defeated by Ford’s Defeat, I want to go out in glory. I’ve done Ford’s defeat in my truck and never had to resort to FWD; it’s the last quarter mile on either side that is quite steep, slightly more so on the east side. I am hoping to drive the T from Reno to Tooele Utah in 2014 for the LHW Association annual meeting. Good luck. I’m going to do a little exploration out that way once the weather warms a little. Thinking of trying the old road from Devils gate to the Willows and grimes Ranch site also. This getting some what frustrating since the Bureau of Land Mis-managment seems to think Nevada is now part of California and has been attempting to close some very old roads without consulting the locals who are not putting up with it. Will advise you if we find anything you might be interested in. Grover, I thoroughly enjoyed your article in the Nevada Magazine about the Lincoln Highway. I want to make one minor correction, which in no way detracted from the high quality of the story and the wonderful pictures. On p. 64 “Tippetts Road” is mentioned and “Tippetts Ranch” is similarly mentioned on p. 65. It is actually “Tippett” Road and “Tippett” Ranch (singular). Maps even make this mistake. The Ranch was first founded by miner John Tippett, an Englishman, in the early 1890s. He died in 1906 (He was buried in Cherry Creek, NV–I have the original bill of sale for his funeral). His wife Alice Bassett Tippett subsequently married my great uncle Gus Sellas. Our family owned the ranch until we sold it in 1970. I worked on the ranch in the summer during most of the 1960s. It was was a bustling, well kept operation featuring a general store, the only phone within 25 miles, and the only bar within 40 miles. However, the golden age for the ranch as a commercial operation was during the time the Lincoln Highway actually ran right through the ranch’s property. The store was always busy (sans alcohol during Prohibition), there was a post office, and parties frequently occurred with music provided by a player piano brought by wagon train from Salt Lake City to the ranch in 1912, expressly to provide entertainment for travelers. The piano is still in our family, we have the original bill of sale, and also about 150 piano rolls of music. Thank you for that. This is the kind of information that historians die for. I’ll be in touch. thanks for the follow! Incredible photos, incredible eye! Would you please contact me on my FB page Lizzi Tremayne https://www.facebook.com/lizzi.tremayne?ref=tn_tnmn ? I am coming to Ca and NV next month and would love to meet you. We’re going over “The Trail”… as you may have seen on my blog. I have “family” to see in Grass Valley too. Going over, also, for vet school 50 yr reunion at Davis…. Please advise. Thank you so much for the lovely photos and descriptions of some places which hold so much attraction for me.